Chicken Maker: Bear with me. Someone said bears were a good way to express felings so I nodded along then drew this polar bear. It represents my love of Coca-Cola and the friendly arguments I have while drinking it. 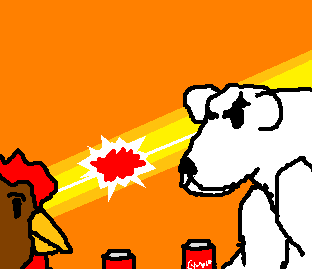 And before any of you lazy hypocrites, as opposed to the very active ones, think it's a polar bear because I'm lazy I'll have you know that Polar Bears are the mascot of Coca-Cola and I actually colored it brown first. Anyways, as I was saying this represents my love of arguing over Coca-Cola though I rarely manage that sort of explosion glare. I'm surprised this didn't get more comments. It is amazing.